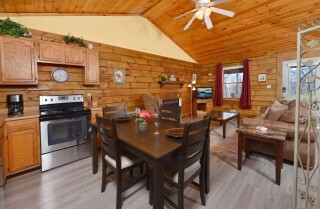 Looking for a special place in the Smokies for a romantic getaway or small family trip? Precious Moments is an excellent Gatlinburg option for YOU. With room for 4 guests, this 1-bedroom, 1-bathroom studio cabin offers a relaxing and inviting space to unwind and reconnect with your sweetheart and little ones. An open layout, wood-paneled walls, and classic red roof help create a true cabin experience. 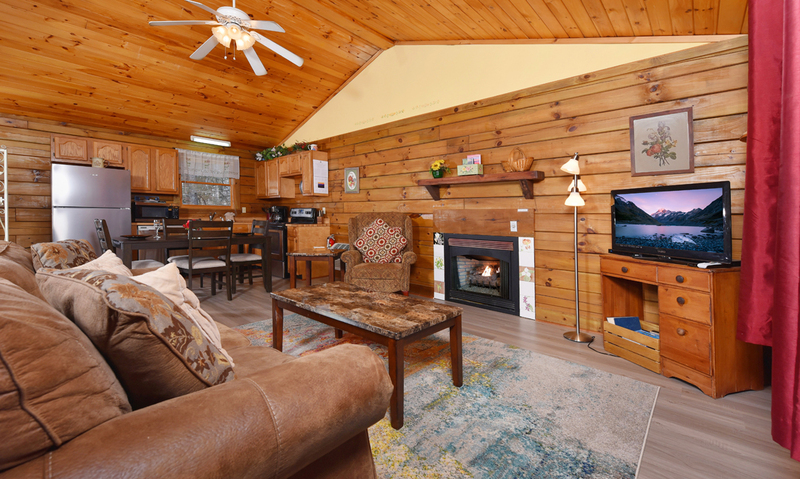 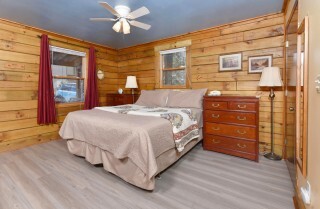 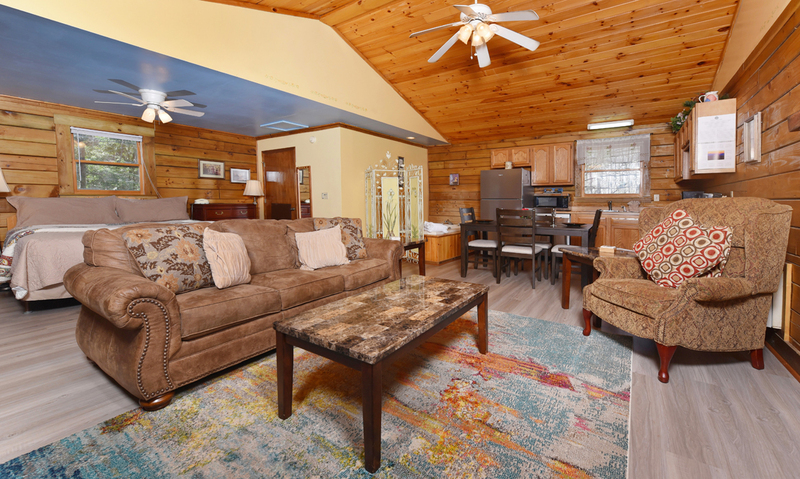 And with a location just a short drive from downtown fun, this pet-friendly Gatlinburg cabin places you near all the hottest restaurants, shops, and attractions of the area. 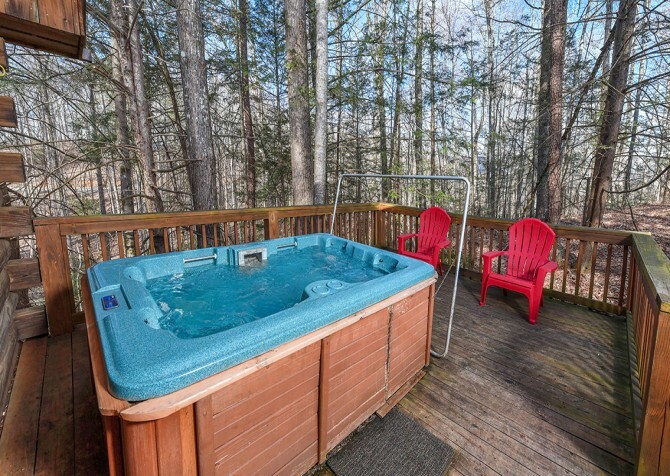 After playing in town, return to hot tub soaks, movies on the flatscreen TV, snuggles by a toasty fireplace, spa baths in the jetted tub, and sweet sleep in the king-size bed at Precious Moments. 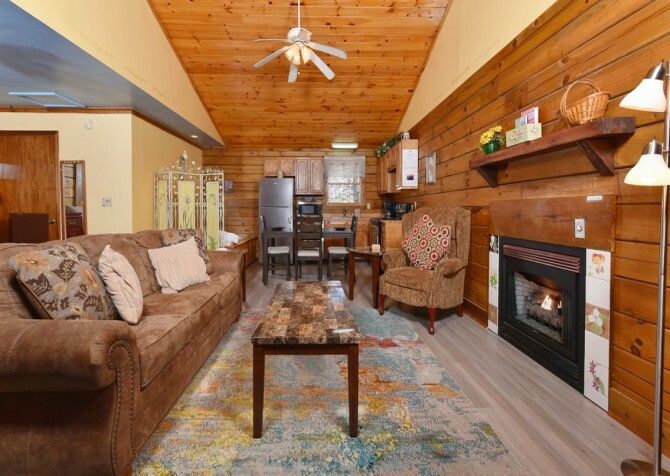 In the living area, sit back on the plush sofa (doubles as a sleeper), flip on the flatscreen TV, and chill with snacks piled high on the coffee table and soda pop on the side tables. 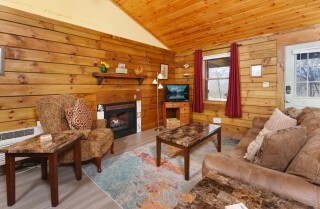 Host family movie nights or bring romantic comedies for your romantic retreat and pop them in the provided DVD player. 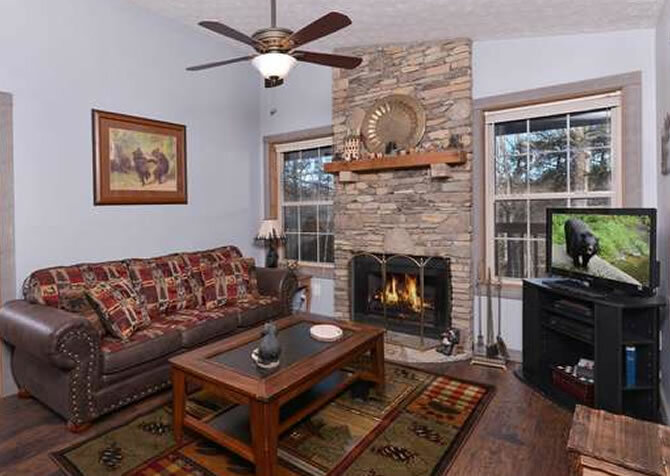 On cool evenings, get cozy by the gas fireplace and read your favorite novel in the arm chair. 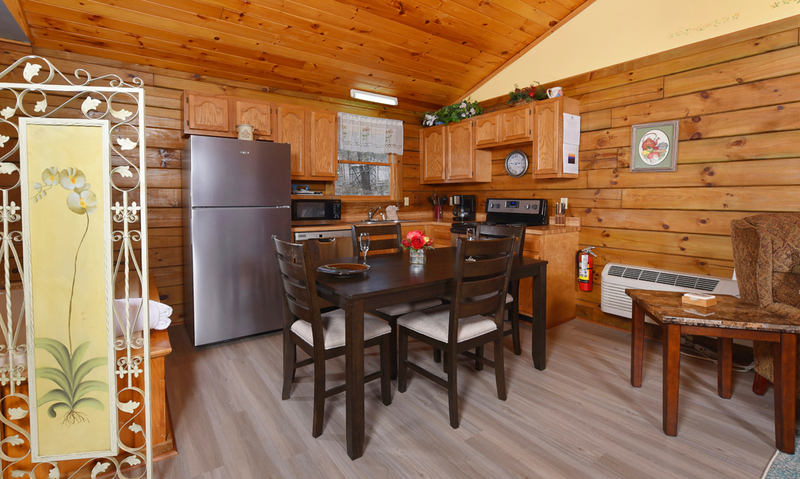 Cooking at the cabin is made easy with the fully equipped kitchen mere steps from the living area. Featuring all major appliances, a stainless-steel double sink, pots and pans, dinnerware, mugs, and more are provided. Keep restaurant leftovers in the fridge, brew limitless pots of joe in the coffeemaker, whip up hot meals on the stove, bake scrumptious sweets in the oven, pop buttery delights in the microwave, and let the dishwasher clean up for you! Your partner will appreciate homemade meals, and the kiddos will go crazy for Mom’s famous macaroni and cheese! 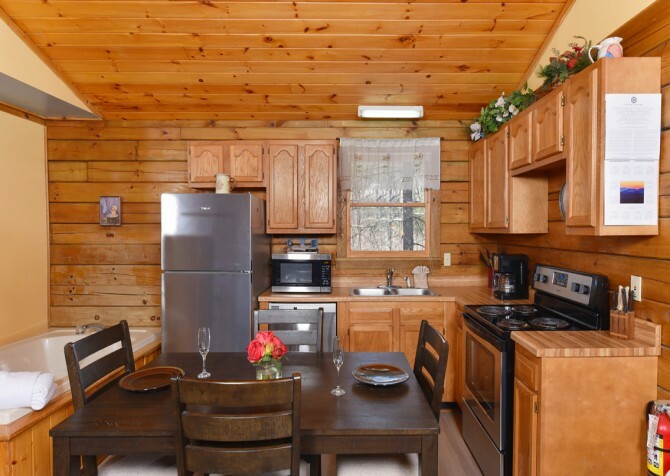 Conveniently located in the kitchen center, the dining area features 4 cushioned chairs accompanied by a marble-top table. This space is not only great for dining but also perfect for board game fun, which Precious Moments provides! Feel free to bring your favorites from home or buy a few new games in town. And pack a deck or two of cards while you’re at it. 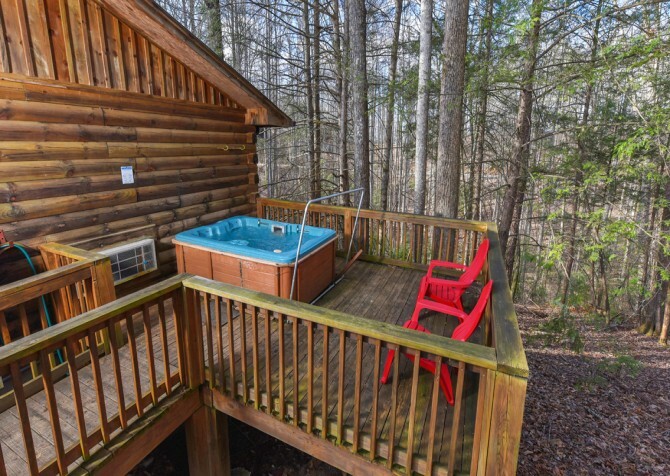 After tons of excitement in town and hiking in the Great Smoky Mountains National Park, unwind and take it easy in the bedroom. 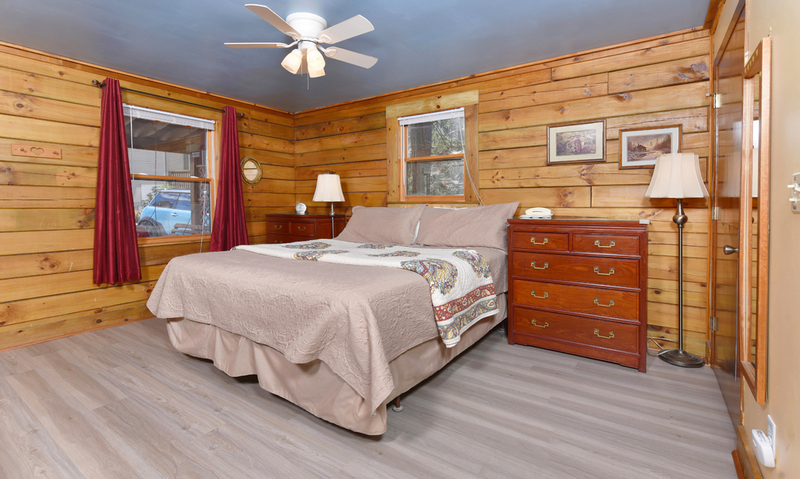 Colorful curtains, pillows that add a pop of color, and pictures on the walls will make you feel right at home, and the king-size bed will keep you comfy and cozy. There are also 2 reading lamps, 2 dressers, a wall mirror, and a ceiling fan, adding to the homey conveniences at Precious Moments. And being studio style, you’ll be able to enjoy a bit of entertainment on the living room TV before hitting the hay. 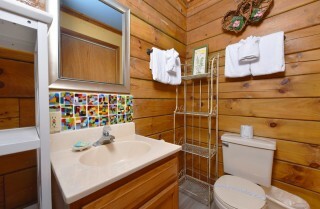 In need of extra pampering? Take a spa bath with bubbles, scented candles, and tranquil tunes in the indoor jetted tub, next to the kitchen. 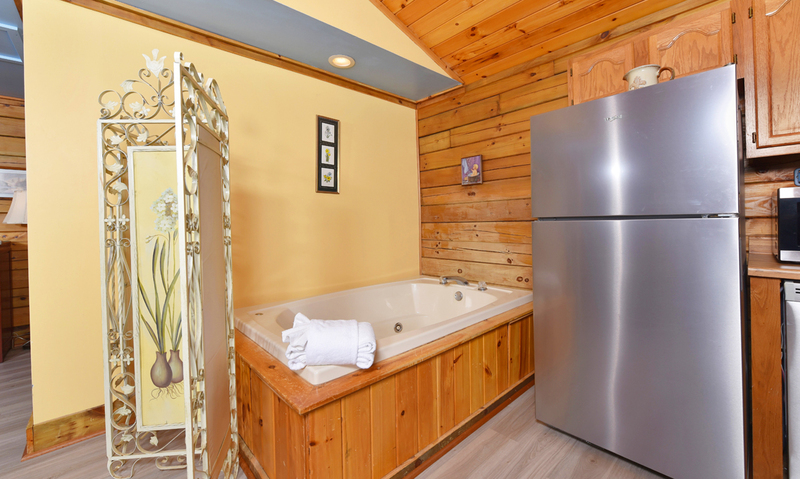 Prefer a steamy shower? The full bathroom steps away offers a walk-in shower. 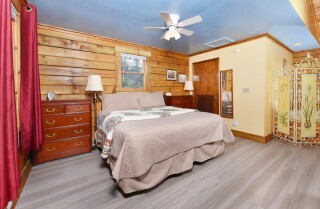 Where will additional guests sleep? The living room sofa is also a pull-out sleeper, meaning up to 4 guests may stay at Precious Moments. Head outside to the deck for muscle-soothing hot tub soaks with serene tree-studded views as this private log cabin sits on 1.5-acre wooded lot. 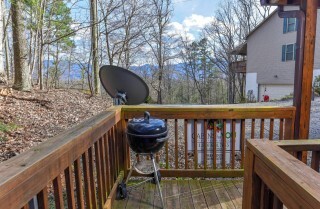 There is also a charcoal grill, perfect for Smoky (see what we did there?) cookouts. When you’re ready to venture to town, easily walk 1 step down to the flat, gravel driveway with motorcycle-friendly parking for 3-4 vehicles. Don’t forget to take a moment to breathe in the fresh mountain air on the front porch swing before setting out for your epic day! One of the best reasons to stay at Precious Moments is the pure fact that this Gatlinburg cabin is pet friendly! Bring along your furry friends and take them with you on a memorable trip to the Great Smoky Mountains, with new smells, intriguing sounds, and exciting adventures around every corner. 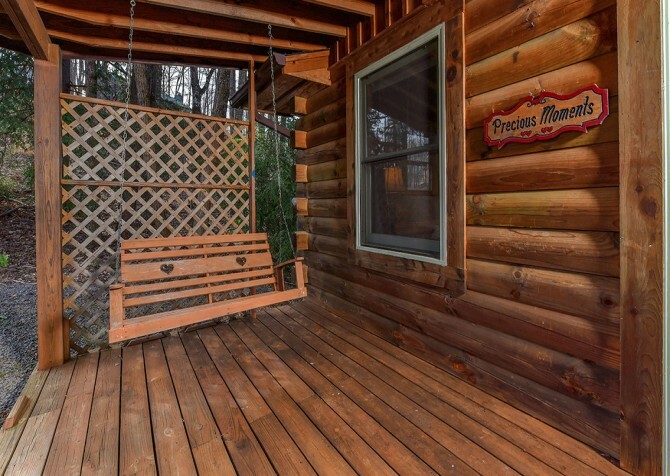 Conveniently located between Pigeon Forge and Gatlinburg, Precious Moments is ideal for anyone wanting to see what these exciting mountain towns have to offer. 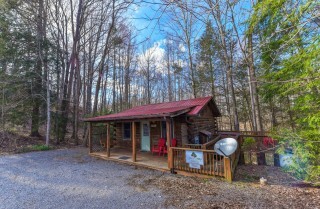 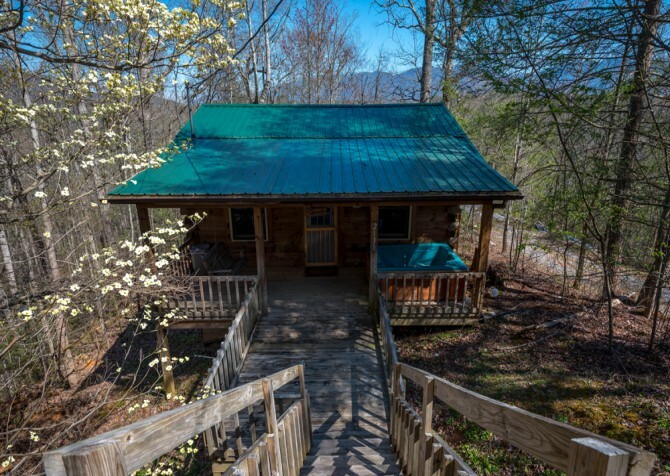 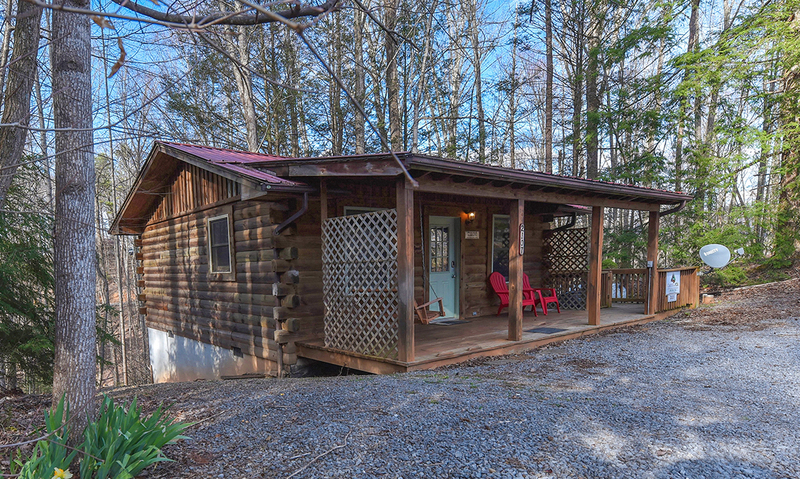 It’s only a 10-15 minute drive to either area, so if you are interested in sightseeing you could enjoy what both towns have to offer when you stay at this Smoky Mountain cabin rental! 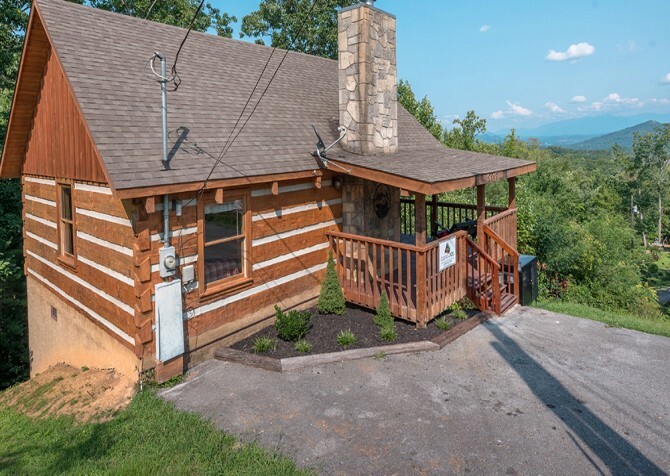 Grab your seat and settle in for an adrenaline-pumping ride through forest trees and down a mountain at your own pace — up to 30 miles per hour — aboard the Gatlinburg Mountain Coaster! Venture under the seas in the Great Smoky Mountains at Ripley’s Aquarium of the Smokies, where walking among sharks, playing with penguins, and petting stingrays is more than possible. 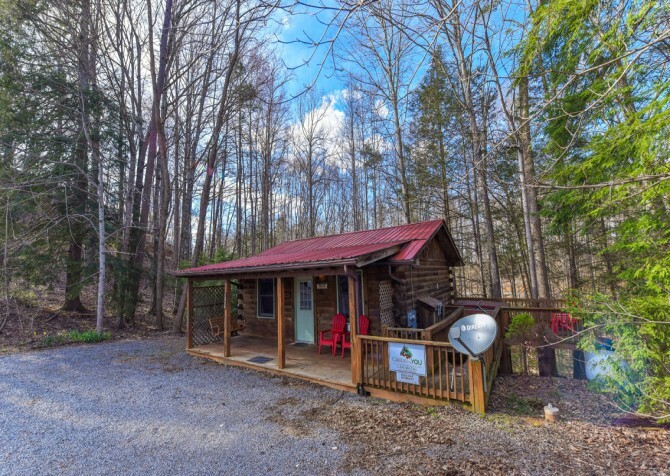 Get ready for belly laughter and smiles for miles at the Sweet Fanny Adams Theatre, featuring live musical comedies, original characters, and fantastic humor. 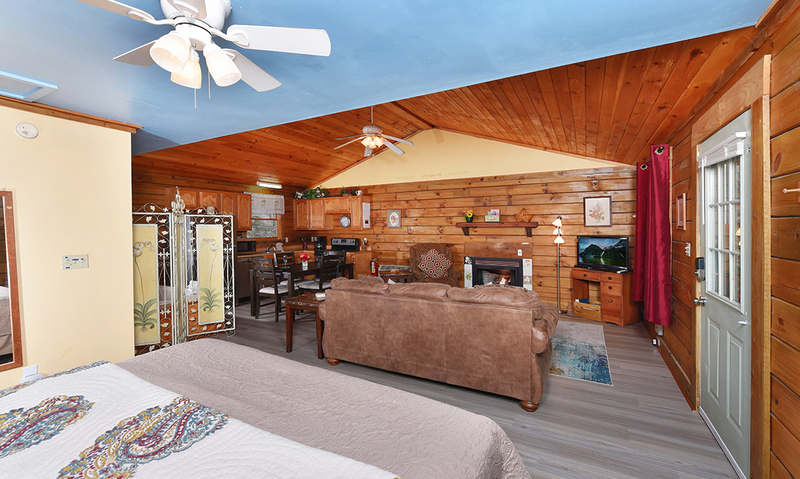 "We stayed in Precious Moments and absolutely loved it there! 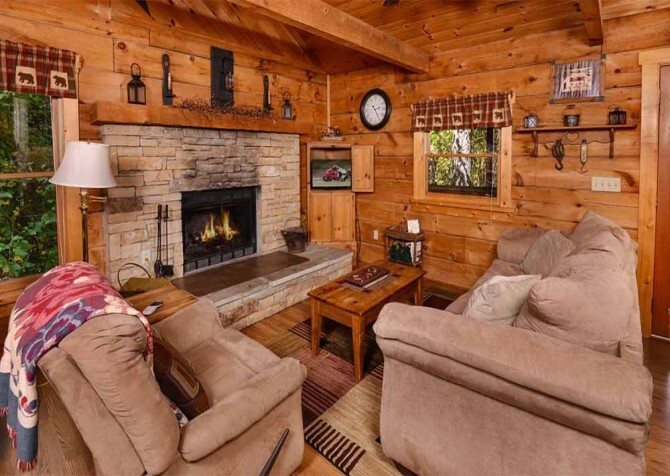 We could not have asked for a cuter, cozier cabin! The cabin had a king sized bed, indoor jetted tub, and a hot tub on the porch. It was very clean when we arrived, and we enjoyed our stay here so much! 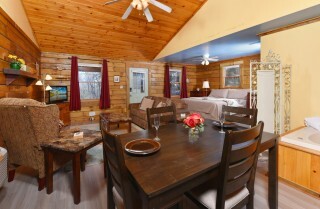 I highly recommend Cabins for You. 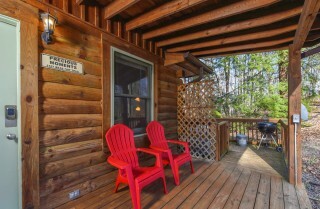 The customer service is excellent. 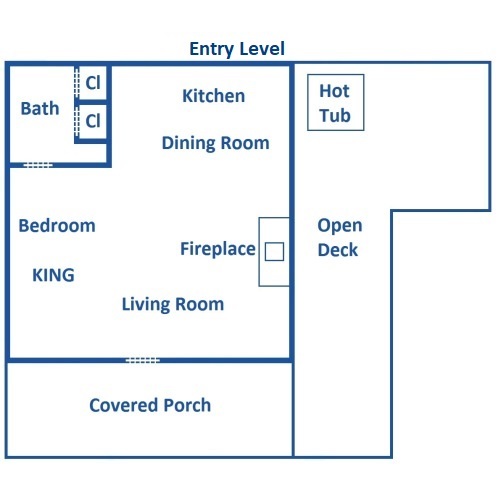 They're very helpful and nice. We will most definitely be back and will for sure book through Cabins for You!"